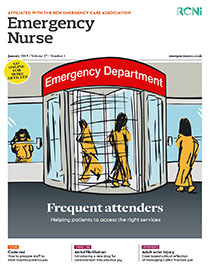 Frequent attenders to emergency departments (EDs) are a heterogeneous group who have traditionally been patched up and discharged with little support. This makes them vulnerable to over investigation and they often have a poor experience in EDs, which can cause frustration among the staff who work with them. This article reviews the literature on frequent ED attenders and explores the related issues. It also describes how a multidisciplinary team (MDT) was formed to identify people in this group, evaluate their attendances and notes to understand their individual needs and identify strategies to improve their options and care while in the ED. The rationale for the formation of the MDT, the process of selecting patients and the interventions commonly used are discussed, as well as the benefits to patients, staff and the trust.